The funds SU2C raises support innovative cancer research that saves lives now. 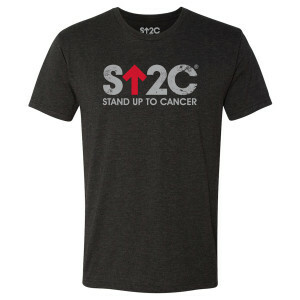 Be a part of the Stand Up To Cancer movement. This comfortable t-shirt features a vintage-style distressed take on our classic short logo. It’s a classic t-shirt that will be perfect in your wardrobe. Really like this shirt’s style and quality of material. Great quality shirts for such an amazing cause. I bought these shirts to help show support for my grandfather who is currently undergoing cancer treatment for stage 3 throat cancer. The quality of the shirts was much better than expected so that was a pleasant surprise! Don’t hesitate to order these to help support the fight against cancer, and you’ll end up getting a shirt you’ll love to wear everyday! this shirt is comfortable and well made : well worth the wait it took to arrive !